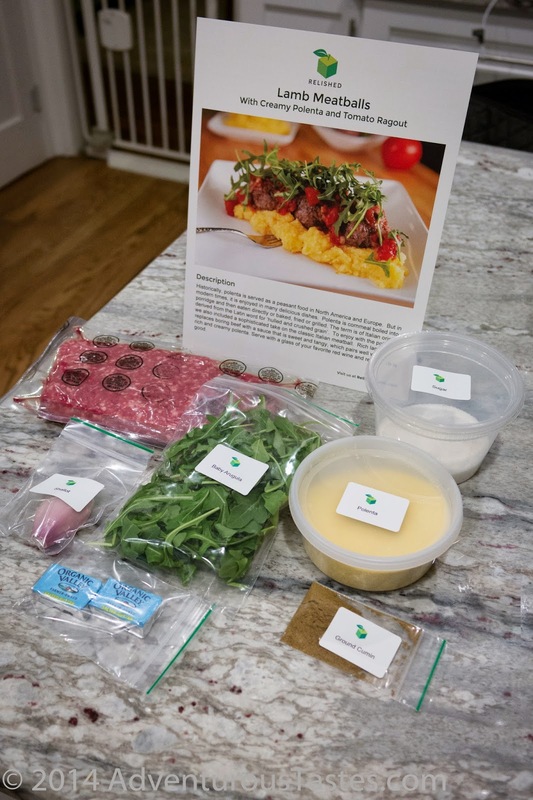 We're no strangers to ready-to-cook meal delivery services. We've already given Atlanta-based PeachDish not just one review, but a second review after they revamped their offerings. Recently, we got to check out Relished, a Chicago-based startup trying to nose into the Atlanta market. Based on our experiences with them, we think they have a good shot at making a big dent into the appetites of Atlantans. Relished sent us three different meals, lamb meatballs with creamy polenta and a tomato ragout; quinoa and roasted vegetable salad with pan seared chicken; and panko crusted cod with roasted baby carrots and asparagus. Huge props to Relished for the gratis food and a three night reprieve on grocery shopping! Ingredients for the lamb meatballs with polenta. 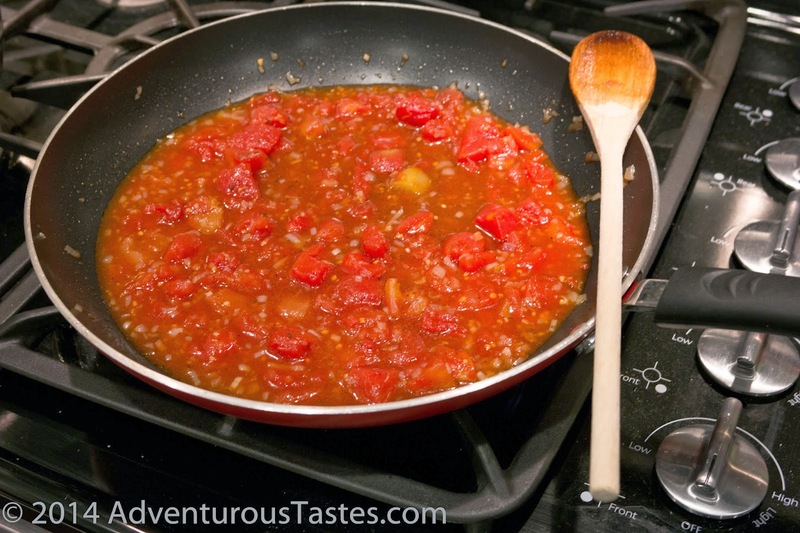 The can of tomatoes is hiding behind the recipe. We kicked things off with the lamb meatballs with polenta and tomato ragout. The ingredients were all neatly packaged and clearly labeled. Aside from dicing a shallot and rolling up the meatballs, there was very little prep work involved in this particular dish. Even making the polenta was quick, a far cry from my own attempts at polenta that involve me stirring corn meal and water until my arm is about to fall into the pot. 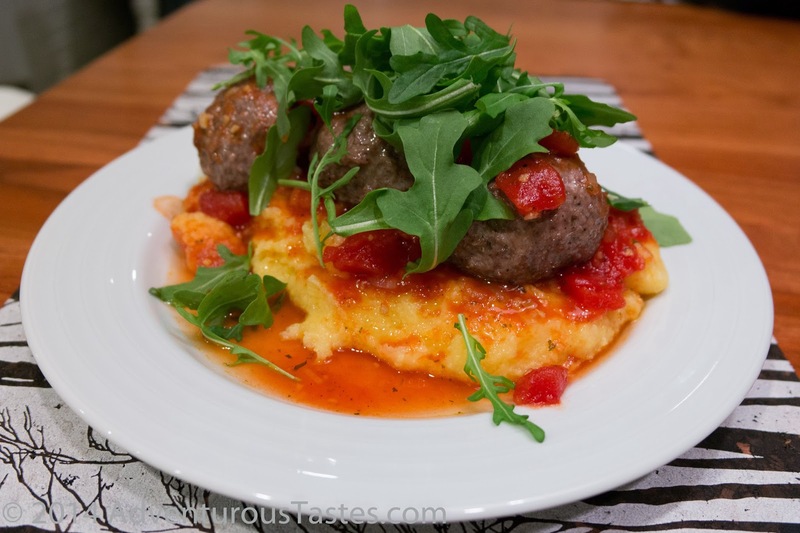 Altogether, the prep took me about the 30 minutes advertised on the flyer, though the meatballs took a little longer than the listed 10-12 minutes to cook through.. After plating the polenta and meatballs, the recipe called for the entire meant to be topped with baby arugula. While I am a big fan of arugula in salads, it felt a bit out of place on top of this dish, even though it did make for a very pretty plate. Still, the finished product was quite good; probably my favorite of the three meals by a nose. While the lamb meatballs were relatively unseasoned (cumin, salt, and pepper), the sweet tomato ragout helped make up for that and also made a great sauce for the polenta. As an unanticipated bonus, the generous portions made great lunchtime leftovers the next day. 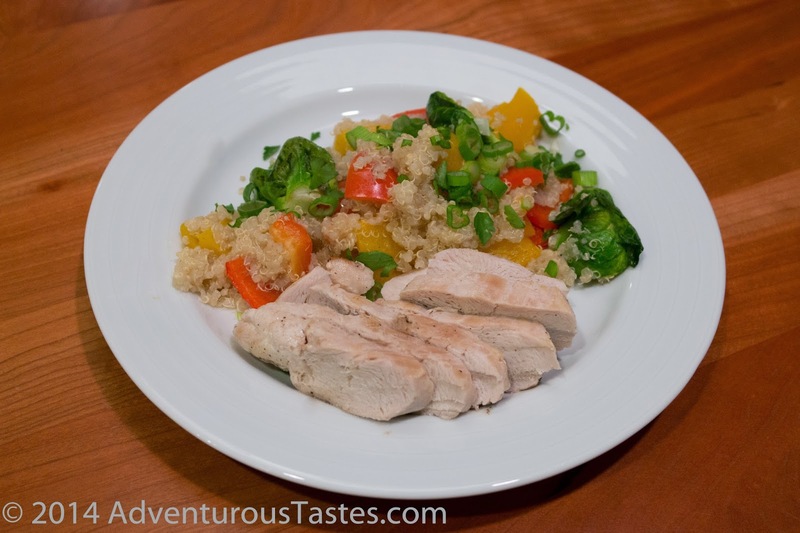 The next evening, I made the quinoa and roasted vegetable salad with pan seared chicken. We are somewhat frequent quinoa eaters and I'm always looking for interesting new ways to make the super-healthy but bland Bolivian staple more interesting. Aside from a yellow pepper that was just starting to get a little wrinkly, the vegetables included were fresh and it appeared that once again we would have plenty of food leftover after dinner. The preparation was easy, and the included recipe page had step-by-step instructions with color photos of each step. Even the most inexperienced cook should have no problem following along. That said, I found the order of the instructions a little perplexing. If you were to follow the instructions step-by-step without reading ahead, you'd have a pot of cold quinoa and cold roasted vegetables while waiting for your chicken to cook. I knew enough to work on multiple steps simultaneously, but the instructions could be a little clearer in this regard. Once everything was cooked, it was simply a matter of tossing everything together. While the colorful salad looked great on the plate, it was decidedly lacking in seasoning. The raw green onion was a bit overpowering and the rest of the salad lacked flavor stand on its own. And the chicken - well, it was white meat chicken cooked in a pan, 'nuff said. This mean won out for healthiness but it was decidedly the least interesting of the bunch. Happily, our final meal from Relished was a winner, and unexpectedly so. My reaction to seafood is usually a groan, and it was no different when I saw the panko crusted cod recipe in among the package from Relished. I often think of home-cooked fish as a recipe for bland food and being hungry an hour after dinner. The one fish I could get behind cooking on a regular basis is salmon, but unfortunately for me Lindsey doesn't share my love of that fatty, pink delight. 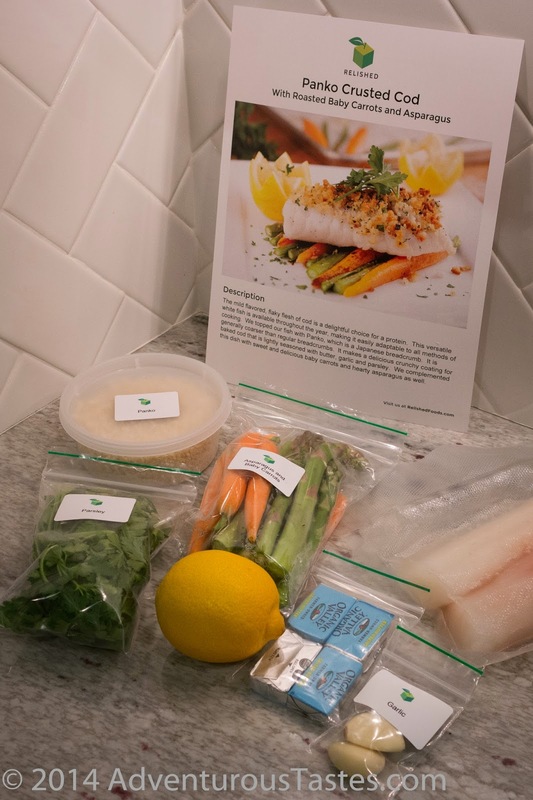 The cod from Relished came neatly packaged along with carrots, asparagus, panko, parsley, garlic, a lemon and organic butter. Prep was very simple on this dish. After chopping the parsley and garlic, you melt the butter in a pan and add the garlic, panko and parsley. Top the fish with the panko and bake it. The instructions said 10-12 minutes but I found it took about 16 minute to cook the fish. Meanwhile, toss the veggies in a bowl with salt, pepper, and olive oil and roast on a baking sheet for 8-10. Again, the instructions were a little unclear about timing the various components to get everything finished at the same time. I would say to get the breadcrumbs on the fish and get that in the oven, then prep the carrots and asparagus and put that in the oven about 5 minutes after the fish. The resulting dish was quite good, so good in fact that I'll be looking to make cod a more frequent dinner guest in the future. 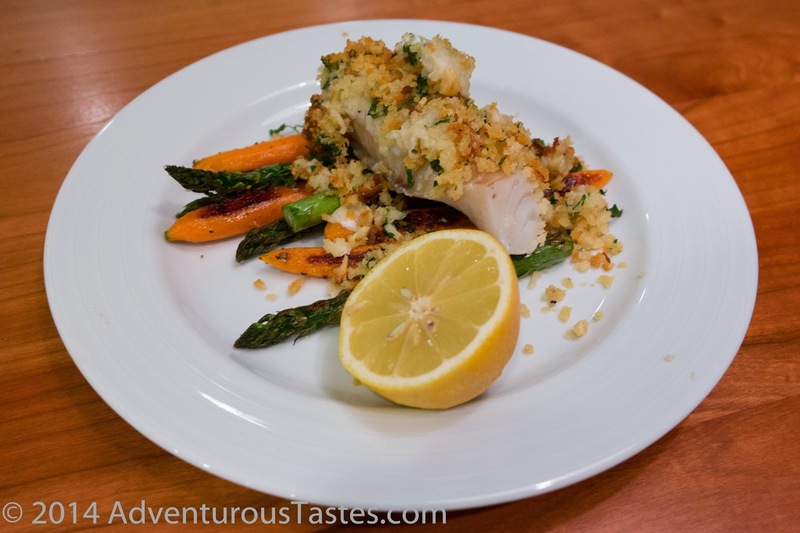 Panko crusted cod with carrots and asparagus: the best fish dish I've made at home in long time! All told, I was quite impressed with Relished. 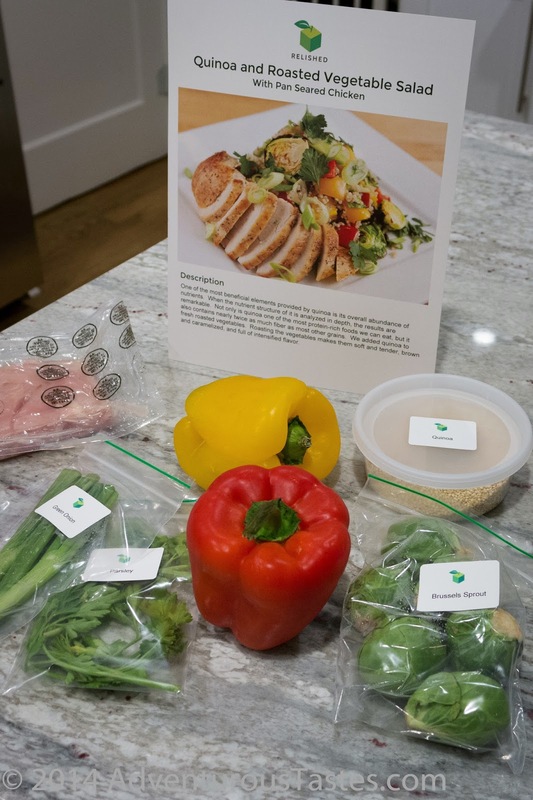 Even as somebody who is comfortable putting together weekday meals without having the recipes and ingredients delivered to my door, I could definitely see calling on Relished to ease the burden of weekday menu planning, shopping, food prep, and cooking. At $9.95 per serving (available in 2, 4, and 6 serving increments), it's no more expensive than decent take out and frankly it's a heck of a lot better than most takeout. Plus, there's been enough food with two of the three meals we had--the lamb meatballs and the quinoa salad--that we had leftovers. As for the inevitable comparison with PeachDish, I don't think you can go wrong with either service as they frankly seem pretty comparable. You check out Relished's current offerings at their website relishedfoods.com. Through April 4, use the promo code AdventurousTastes to get 60% off your first order. Happy cooking!